Bed rail height adjusts from 31-37". Length adjusts from 34-45". 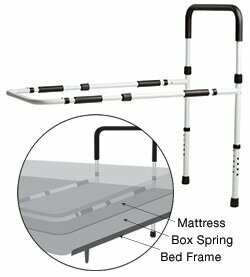 Width is 20.5"
Side rails are for the purpose of aiding in turning and repositioning within the bed and are not intended to be used for restraint purposes. the adjustment hole to ensure a positive lock. are secured properly before use. may require other means of safe positioning.